Is he your favourite marvel hero? Which cartoon do you think Remy LeBeau / Gambit looked the best in? Which cartoon did you like Remy LeBeau / Gambit best in [as a character, don't include looks]? Do you think Gambit?/Remy should be with Rogue? The fans pick: Totally! Who else would be better? Do you think Taylor Kitsch was cast well to play Gambit in the upcoming movie? but the parts Gambit was in were my favorito por far. which were towards the end and at the end. AU with elements from the comics –– Sometimes, things just don't work out. Sometimes, they do. For Rogue and Gambit, sometimes it feels like things'll never be the same. Will the get it together? Or is it too little, too late? Ororo has moved with her family from NYC to New Orleans mid senior year. Trying to adjust to her new environment is a difficult task. Her life is really turned upside down when the high school bad boy takes a particular interest in her. 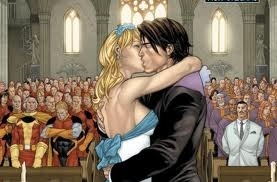 Who is Gambit marrying here?